Polygon Homes, one of 5 developers building at The High Point, has very few units available in their 96 unit Redwood at High Point condominium community (plus 7 SFR houses). These are ready to move in to today – aren’t you lucky?? I have to wait until August before getting the keys to my townhome there. Both units currently being advertised are “Genesee” floor plans, which are 2 bedroom 2 bath condo suites with single car garages. “Lot 906″ (building 9) is either a 2nd or 3rd floor 2 bedroom, 2 bath suite with a one car garage (2nd floor is direct access, 3rd floor is not attached). Click here for the floor plan. This building faces west, and this unit has a deck with a view of the pond and Puget Sound. All of the homes here are very nicely appointed, gourmet kitchens with maple shaker cabinets with brushed nickel handpulls, and stainless steel Whirlpool appliances. The master bath includes a shower with a handset ceramic tile surround. “Lot 1001″ (building 10) is a ground floor 2 bedroom 2 bath suite with an attached one car garage that walks right into the gourmet kitchen. Click here for the floorplan. This building also faces west. This unit has over $6,000 in upgrades – which translates to a hardwood entry and upgraded carpet in the dining room (according to their flyer). This ground floor unit faces the park, close to city views, and a nice trail (around the pond). This unit happens to be ADA compliant and accessible – something hard to find. It’s ready to move in NOW. If you are interested in taking a closer look at The High Point, it’s one of the few developments of its kind, inside the city limits. If you would like to have buyer representation, a Buyer’s Agent, please email me at wendyhj@greenspacesrealestate.com. Polygon pays SOC (selling office commission) so it won’t cost you a thing to have someone on your side. I know the sales staff, the community, and am moving there myself so have been through the many hoops that a developer such as Polygon makes you jump through. I’ve lived in West Seattle for 10 years, so if you are moving from out-of-area, I can get you plugged in to the many wonderful things there are to be found in West Seattle. Seattle Times’ Climate Challenge has been running all month long. Read the “live Q&A;” online transcript from today’s session with Amy Snover and Jeremy Littell, scientists with the University of Washington Climate Impacts Group. Visit the Seattle Times Climate Challenge homepage to learn more about reducing your carbon footprint. New session begins June 3rd! I spent Sunday afternoons in March participating in a new “yoga with your dog” class at the Seattle King County Humane Society facility on SE Eastgate Way in Bellevue. The instructor, Brenda Bryan, teaches a “Gentle Yoga” class at 8 Limbs Yoga in The Junction of West Seattle – and has recently added a new dog yoga class at the Capitol Hill location of Downtown Dog Lounge. I’ve been bugging her for a West Seattle location since the first day of class. I’d spent months looking for a dog yoga class because of a show shown on Animal Planet in 2005/06, called “K9 Karma“. I was a recent dog adopter and watched lots of dog shows to learn more about them (dogs, not shows). Host Kari Harendorf, who is a dog trainer and also owns a yoga studio in New York City, began and ended each show in the yoga studio with her students and their dogs, but she and her shepherd mix, Charlie (aka Peanut) would go on adventures all across NYC. It was a great way to be a tourist in New York, told from the dog’s perspective. I longed for a yoga class here – and kept googling “dog yoga” for over a year until finally something turned up. I was lucky to find the Humane Society class flyer online about a week before class started, althought I was too late for the initial orientation. I encourage yoga practitioners of all levels (and no experience is required at all, really) to try Yoga With Your Dog! I found it a fun class, and very relaxing for my Italian greyhound, Sophia. Unfortunately for me, my dog weighs only 16 pounds and isn’t much of a “yoga prop” for me, even tho she did make a great partner. When Brenda brings a class to West Seattle, you can bet I will be there! View the Yoga With Your Dog flyer from Seattle King County Humane Society. A new session starts June 3rd! 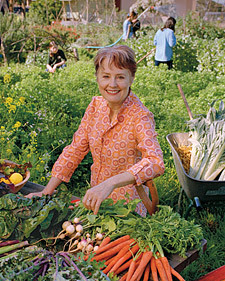 The latest body+soul email newsletter links to an online exclusive on the MSLO web site – an interview with Chef Alice Waters, regarding sustainable food, kids’ eating habits, and more. They also have published a web-exclusive resource list of programs to help you become an organic farmer. If you’re interested in visiting a successful, local organic farm – or even learning and working on one – Full Circle Farm in Carnation has some openings and also offers internships with some nice rewards. You can also buy their produce at over a dozen local area farmers markets. Want to own your own farm in Carnation? Click here to see current listings of real estate for sale in the fast growing east King County town of Carnation. And go play in the dirt today! Came across a great post on Seattlest about Saltaire’s use of a goat clearing crew from “Rent-a-Ruminant” on Vashon Island for a quarter acre building lot at a very busy intersection, Dearborn and Rainier. Goats are more eco-friendly because they’re an alternative to using heavy equipment. Saltaire Homes is one of the green builders at The High Point in West Seattle. Read the Q&A; session here. Last night I attended the inaugaural meeting of a newly formed group, Sustainable West Seattle. Nearly 40 people were in attendance and we nearly overflowed the meeting room at the High Point Library on 35th and Raymond. We were visited by one of the founding members of Sustainable Ballard, who was able to share some of her experiences and give some advice about trying to start a group like this. But the number one topic discussed was Transportation – using public transportation to, from, in, and around West Seattle can be very challenging and takes a lot of time due to Metro’s inefficiency. There are a lot of people interested in working on and improving transportation! One of my personal interests is local food, as evidenced by my three years serving as Secretary on the Board of P-Patch Trust. My term ends on Wednesday, freeing me for other projects or organizations. My plan was to focus on more animal-related efforts, but with our move to High Point this summer and the new direction of my real estate business (I will be a Built Green “special agent” soon! ), I expect to be busy with HOAs (for my local condo community and also the Master Community of High Point) – and now Sustainable West Seattle. Sustainable West Seattle is just getting off the ground and trying to figure out what members’ interests are and what skills and experience volunteers can bring to the organization. The group plans to meet on the 3rd Monday of every month – and smaller groups of volunteers may meet more often if working on a project. The location may move around, so be sure to check the web site for the most current information! Wow, this is too cool. A whole web site and series of 7 global music concerts in support of greening the Earth and reducing global warming. It’s an MSN channel that “melds music and movement”. Live Earth, as MSN editorial director Mark Pawlosky points out in his inaugural column, “is a user-friendly, green-tinged site wrapped around one of the most ambitious music events of all time”. In fact, you can even click on a link to automatically add the appointment to your Outlook Calendar – or your MSN Calendar, Google Calendar, Yahoo Calendar, Apple iCal – or get “Windows Live” alerts. Luckily it’s a Saturday or else I would have to take the day off work to watch! Put it on your calendar! Visit Live Earth and the Alliance for Climate Pretection, the beneficiary of this fundraising effort. There is even a section on the web site called Green – that gives you tons of tips on how to live green, reduce your footprint, and your contribution to the global warming problem. Where does Seattle fit into all this? Seattle is listed as one of the 10 greenest cities in the United States according to the Live Earth web site. Read how Seattle’s current Mayor Greg Nickels has led us in meeting the emissions reduction targets of the Kyoto Protocol, and challenged every mayor in the U.S. to do the same.